August Touchard, left, will try to help her team make a deep run in the CIF-SS girls basketball playoffs. 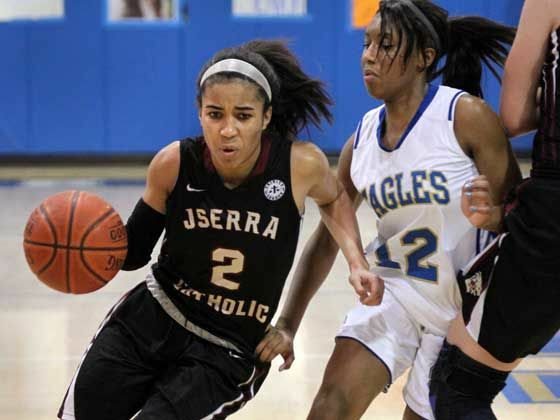 JSerra’s girls basketball team played one of the toughest schedules in the county in an effort to prepare for the CIF-SS playoffs. The Lions went 20-6 overall, finished second in the Trinity League and had impressive victories on the road over St. Bernard of Playa del Rey and La Jolla Country Day. They performed admirably in losses to Bishop Montgomery of Torrance and Santiago of Corona. JSerra had a lead on top-ranked Mater Dei heading into the fourth quarter before the Monarchs pulled out the victory. The Lions went toe-to-toe with Windward of L.A. before the Wildcats rallied in the fourth quarter to pull out the victory. Mater Dei and Windward are ranked No. 1 and No. 2, respectively, in the state by Cal-Hi Sports, so the Lions are right there with the top teams. Windward happens to be the top seed in Division 4AA, where the Lions are seeded No. 2.